Thanks to the extraordinary insights of blogger Kevin Erdmann, the issue of housing costs and inflation has been brought into better focus. Erdmann recently brought up manufactured housing, or house-trailers, a wonderful topic. This is no small matter. Housing consumes about 27% of typical household budget, but food only 10% and gasoline less than 4%. See here. Yet housing is hardly a free market. Zoning out housing density is ubiquitous in U.S. cities, and trailers are criminalized routinely. The result is artificial scarcity, a housing shortage ironically made worse by tight money. According to the Manufactured Housing Institute, the average cost of a manufactured home in 2014 was about $65,000, and cost about $45 a square foot at retail. The price of a traditional, “stick-built” home was more than double that, or $97 a square foot (yes, that excludes land). My guess is that in free markets, we would see innovations such as stackable manufactured housing units for urban or close-in suburban settings. Pioneer-types are already experimenting with shipping containers in this way, another type of housing that should be rapidly legalized. A real-estate entrepreneur could buy a lot in or near a city, drag on some manufacturing housing or shipping containers, and be good to go. When his units filled up, he starts stacking. My guess is that Americans are not ready to un-zone property, or stand idly by while the next-door neighbor pulls a couple trailers into the backyard to work as rentals. Voters become greenie-socialist control-freaks in their own neighborhoods, from Newport Beach, Ca. to Brooklyn. For the U.S. Federal Reserve to obsess about measured rates of inflation, when there are substantial structural impediments in a major component of measured inflation (that is, housing) raises troubling questions. To date, the Fed’s announced 2% PCE inflation target rate, which evidently has become a ceiling, appears to be a noose around the economy’s neck, judging from real GDP growth, or from falling NGDP trends. As cities continuously raise barriers to new housing supplies, one wonders if the 2% inflation target is too low. One might also ponder why FOMC transcripts are full of jibber-jabber about energy prices, and so rarely touch upon urban housing costs. That may be the role of industrial production growth presented as YoY growth of the 6-month moving average. Note that it only turns negative after a recession (as defined by the NBER) has already begun. Sometimes quite a way into the recession (as in the 1973, 1981 and 1990 recessions, for example). In January the measure turned negative (-0.2) for the first time after the “recovery” was completed almost six years ago. Despite the Sturm und Drang of international and market developments, the U.S. economy is, all in all, looking pretty good. I still expect to see U.S. GDP growth of about 2¼% for 2016. I still expect unemployment to edge down to about 4½% by late in the year. And I still see inflation edging up to our 2% goal within the next two years. So I’m not down—it all looks good to me. The echoes of 2008 became stronger last week as both headline and core US inflation as measured by the CPI rose faster than expected. It is a very dangerous cocktail when the claque sees inflation yet nominal growth expectations are weak. It caused the Great Recession when central banks misread the situation. Hopefully they will have learned their lesson, but the current tightening bias of the Fed doesn’t give us much confidence. Not to bust anyone’s NIRP bubble, but while YOY CPI inflation is 1.34% due to food & energy, YOY core inflation rose to 2.22% in January. I did NOT realize until just now that this month’s 0.29% rise in core CPI was the highest m/m since 2006. It is hard to disagree with the charts over the short-term. The longer term is a bit different, of course. But does it mean the Fed should take act? The markets decided the new information content from the CPI data was virtually nil. Why were markets so calm? 1. 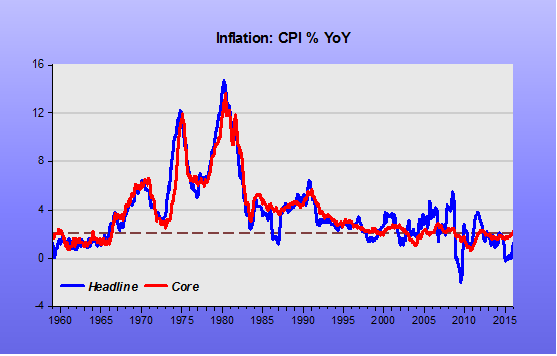 The Fed looks at the far superior Personal Consumption Expenditure price index or deflator. It is composed of the dozens of individual price index estimates used to deflate nominal spending to derive a supposedly “real” level of spending for each category of goods and services purchased. Compiling these indexes is a task fraught with pitfalls. At least PCE uses actual data on expenditure rather than the CPI surveys of consumer expenditure as a starting point. It also includes items bought on behalf of consumers by their employers like healthcare and insurance. It also estimates the financial benefit of services not paid for, like banking. PCE has historically run 0.5% lower than CPI and been far less prone to volatility. The PCE deflator much more quickly captures substitution effects, as consumers switch purchases from higher priced goods and services to lower ones, or like today (probably) switching spending from energy and goods sectors in deflation to housing, healthcare and education – increasing the pace of service sector inflation? Looking just at the service sector will be very misleading. The housing element of CPI remains a minefield as Kevin Erdmann constantly reminds us. Artificial shortages abound and have significant effects. Artificial demand in education thanks to state-subsidised loans also leads to price pressure, and we all know about restrictive practices in medicine. 2. The Fed has made it clear since the market turbulence that it caused will be incorporated into its future actions. 3. Nominal growth is still horribly weak. Core CPI may be trending up but nominal Personal Consumer Expenditure, i.e. not deflated, remains stuck in a 3% trend – down from the 4%-5% trend achieved towards the end of QE3 when nominal spending peaked at 4.96% in August 2014. I remain unconvinced that PCE will move up meaningfully towards any higher trend in CPI. Nominal growth, historic and expected, remains just too low. And, of course, active monetary policy is clearly biased towards tightening. And here we may get a horrible echo of 2008 where nominal growth expectations are flat or falling but the claque of inflation hawks is fretting about cost-push inflation. The Fed should ignore the claque and laser-lie focus on nominal growth expectations, but will they? The other echo of 2008 comes from the accounting identity that if inflation really is rising and nominal growth really is weakening then the counterpart has to be in weakening RGDP and weakening productivity. And this is precisely what we are seeing. RGDP is weak and so is productivity. I am a bit more more sanguine about productivity, even if arithmetically it is shown to fall. 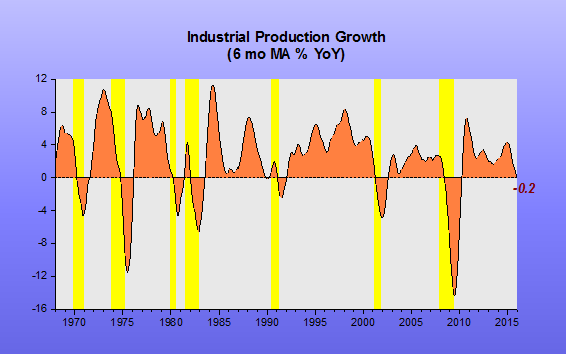 It may not be falling as the deflator may be too high, underestimating real growth, and thus productivity growth. Why is this? First, because it is so fiendishly difficult to directly measure productivity, especially in our service-sector dominated world. There are hardly any detailed temporal or cross-border studies of productivity by industry segment, just windy, useless, macro level stuff by country. Output of physical stuff is relatively easy to measure in both nominal and real terms, as long as the quality of the stuff doesn’t change too much: a bushel of wheat, a barrel of oil, a table. But think of a college degree, a cable subscription or a visit to the dental hygienist and things get trickier. Quality issues are very, very tricky to gauge. It should be for economic historians and politicians to argue about the quality of the nominal growth, the balance between real and inflation within the nominal figure. Third, we think it will rise once the nominal economy begins to run hot again. Why should businesses invest to economise on labour when labour is so plentiful? Why should businesses invest when sales are so weak and expected to remain so? It has been noted already by Market Monetarists and others that George Osborne and his UK Treasury team are concerned about the low level of expected Nominal GDP growth in the UK. 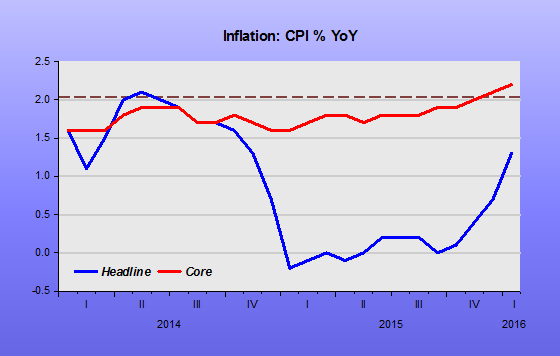 The latest January 2016 CPI figures showing just 0.3% YoY growth will only worry them more. The correct inflation number for policy should be the GDP Deflator, not CPI, but it is also pitifully low and dragging down both RGDP and NGDP. But whose responsibility is NGDP growth? It is no good Osborne worrying about it and then doing nothing. The Treasury sets the targets for Bank of England monetary policy. Monetary Policy Framework: The Bank’s monetary policy objective is to deliver price stability – low inflation – and, subject to that, to support the Government’s economic objectives including those for growth and employment. Price stability is defined by the Government’s inflation target of 2%. The remit recognises the role of price stability in achieving economic stability more generally, and in providing the right conditions for sustainable growth in output and employment. The Government’s inflation target is announced each year by the Chancellor of the Exchequer in the annual Budget statement. Sam Nussey, Nikkei: Governor, with the BOJ having joined the ECB Switzerland, Sweden, Denmark, and having used negative rates, do you see negative rates as part of the BOE’s arsenal and could you envisage a situation in which they would be used? Mark Carney: Well let me start that discussion we had at the MPC was whether now was the right time to raise interest rates. And the judgement, as you’ve seen nine to nil, was that now was not the right time to raise interest rates, but we had a forecast – we have a forecast – which requires some increases in interest rates in order to sustainably achieve the inflation target. And the markets understand this tightening bias, just look at UK stock markets and UK government bond yields. Sterling has been relatively weak vs the even tighter USD, and on rising trend vs the EUR although weak just recently. The result is both lower and lower NGDP growth and lower and lower NGDP growth expectations. Something has to change and it has to be led by Osborne and the Treasury. 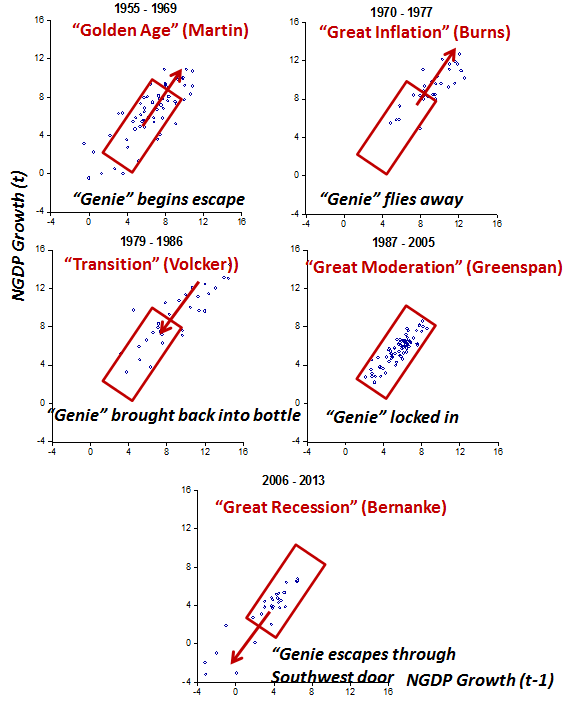 Central bankers change little once in office. Osborne wants to follow his instinct and balance the budget by 2018 despite the most vocal mainstream macro-economists urging him not to. It’s sad that most are crypto-Corbynites, but that is social science academia for you, there are no jobs for free-marketers. It’s an increasingly closed shop for anyone not a socialist. Fortunately, students, and more importantly voters, aren’t so dogmatic. Our university social science departments will become like old theology colleges, with the professors just chatting amongst themselves. Yet when Osborne ordered an inquiry into possible changes to the inflation target mandate he meekly accepted the macroeconomic consensus that there was no need to change, in fact it would be a bad thing. To his credit the crypto-Corbynites are amongst the most sympathetic to NGDP Targeting, but he shouldn’t let that worry him – they much still prefer big deficits over monetary policy. Osborne needs to show some leadership about NGDP Targeting and not just the deficit. He should keep the CPI target if he has to, but combine the price stability and growth and employment targets into one NGDP Target. It really isn’t that difficult to understand. He and his advisers can read some of the answers to the very weak mainstream macro criticisms here and here . The ONS might need to raise its game a bit, but calculating NGDP really should be easier, faster and more reliable than RGDP. They should relegate the very tricky Output method of calculating GDP to the third choice (like in the US) and promote either the easier Expenditure method to first place (like in the US) or Income. The Output method was preferred once upon a time when advanced economies grew, dug or made stuff (i.e. agriculture, mining, manufacturing). The output of the dominant services sector cannot be so easily measured. Given that I don’t see monetary policy as so tight right now, I suggested that if we have a recession it was likely to be a risk premium recession. The big uptick in gold prices is consistent with this view, though hardly proof of it. To get more specific yet, I am very much a fan of the ngdp rule approach to monetary policy, but I am uncomfortable with one strand in market monetarist thought. I worry when low ngdp growth is blamed for low growth rates of real gdp. 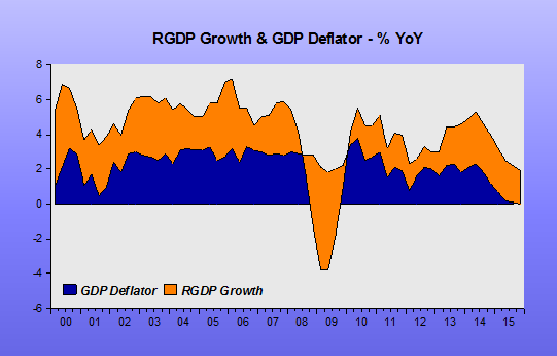 From the chart, you see that a fall in NGDP growth results in lower RGDP growth (and lower inflation). Now what is really weird is that the real world did in fact seem to be a place where double divine coincidence were true.Until it wasn’t. 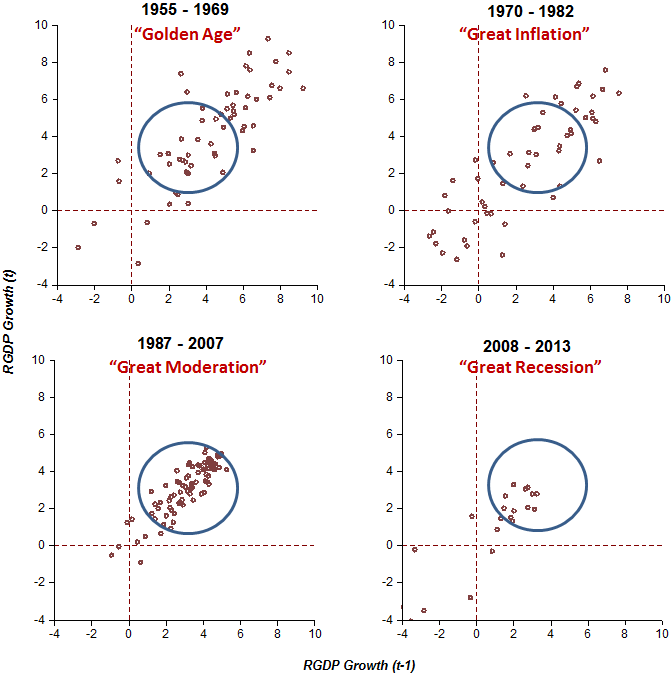 An outside observer, who did not know that central banks were targeting inflation (OK, it was CPI not GDP deflator inflation), and who mistakenly thought they were targeting NGDP instead, would infer from the data that stabilising NGDP did indeed seem to be consistent with stabilising RGDP, and that the NGDP version of divine coincidence were true. Furthermore, that outside observer would see no reason to change his mind since the recent recession. It is the P version of divine coincidence that has failed empirically, when we look around the world. The NGDP version of divine coincidence is hanging in there. Inflation targeting seemed to work pretty well, and the theory about why it worked pretty well came after, not before, the policy itself. But any outside observer, who looked at the data, but didn’t know that the Bank of Canada said it was doing IT, could equally well have asked: “Why does PLTwork pretty well?” or “Why does NGDPLT work pretty well?”. But nobody asked those questions, of course. Since the Bank of Canada said it was doing IT, it must be IT, rather than PLT or NGDPLT, that seemed to work pretty well. With hindsight, we were daft, because we let the Bank of Canada frame the question for us. All we know from 1992-2008 data is that either IT or PLT or NGDPLT seemed to work pretty well, but we don’t know which. It took a shock to let us see the difference. Since IT seemed to work pretty well, and I never thought that maybe it was PLT or NGDPLT that seemed to work pretty well, I became a supporter of IT. And I had provided some illustrations in 3 Dogs, two didn´t bark. Since becoming a devout Market Monetarist, I have pondered not the goal but the how—how does the U.S. Federal Reserve and federal government meaningfully target nominal growth in GDP at an appropriate level, i.e. NGDPLT? It may be that plain-vanilla QE, without the straitjacket of interest on excess reserves, would be effective. It appears QE was effective in the United States, especially the open-ended QE 3, even when hamstrung by interest on excess reserves. But I have also been curious about marrying QE to tax cuts, such as a tax holiday on Social Security and Medicare taxes (the FICA taxes), with the lost revenues supplanted by the bonds obtained through QE. The FICA tax cut scheme has the additional benefit of lowering the cost of employment (remember, employers pay half of FICA taxes) at the very time that unemployment is a problem. I had assumed my tax cuts+QE scheme would never appeal to serious economists, as it is suspiciously close to monetizing the debt, if not outright money-printing to run the federal budget. But it turns out the highly regarded and deferred to Michael Woodford, the Colombia University professor, also backs tax cuts+QE! Woodford has accolades too numerous to mention, and gets invited to the Kansas City Fed’s annual Jackson Hole confab as a speaker. 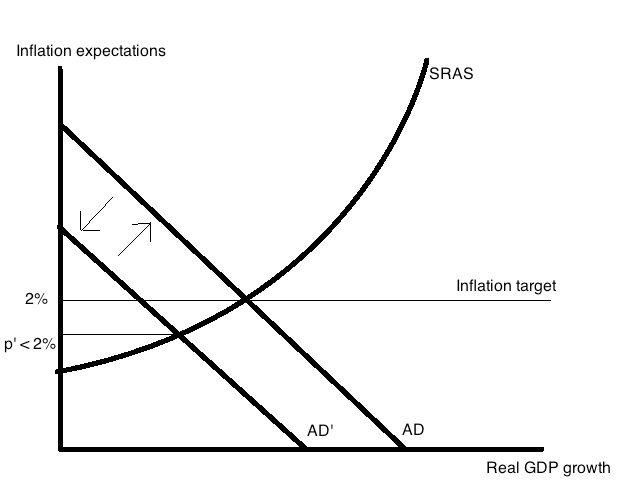 “I believe that one could achieve a similar effect, with equally little need to rely upon people having sophisticated expectations, through a bond-financed fiscal transfer, combined with a commitment by the central bank to a nominal GDP target path (the one that would involve the same long-run path for base money as the other two policies). True, Woodford leaves open whether the “fiscal transfer” is tax cuts or direct spending. But I think most economists would concur that leaving money in the private sector is better than public spending, and so we can say, ceteris paribus, Woodford endorses tax-cuts+QE. Back when the U.S. space program was in the early and televised days, NASA did not refer to the Atlas or Gemini or Mercury rockets as “blasting off.” Too cartoon-y. So, NASA used the words “lift off” to describe a launch, even though “blast off” is more correct. Woodford appears the very epitome on erudition and intellect, deeply committed to his craft. But obscurantism is everywhere. He also says no promise should be made to unprint the money. So…why is Michael Woodford not the Chairman of Federal Reserve?